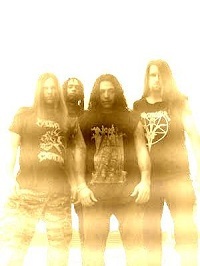 Formed in the January of 1997, the Florida death metal band quickly got down to work and released the City Of The Dead demo in June of the same year. The band played the Milwaukee Metal Fest the next year and quickly gained a reputation for its live show and brutal delivery. While signing to Monstrosity-owned Conquest, the band released the said demo (plus two bonus songs) on Fadeless records and in CD format. The debut was supported opening for Cannibal Corpse across the USA (the band had previously toured with Infamy on the US east coast) and a second album was released. The second outing was to be followed by a tour opening for Marduk, but when that tour was cancelled due to the political situation of the United States, the band jumped on another tour! Oulette exited the fold in 2002. A tour of Europe featured Coffin Text's bassist/vocalist Robert Cardenas. In the autumn of 2002 guitarist Jerry Mortellaro left the band and was replaced by Lord Blasphemer's Eric Hersemann. Coates soon followed him however and left the fold. In the meanwhile Pessimist guitarist Kelly Mclauchlin joined Diabolic. Mclauchlin was a member of Diabolic in 1996. The departed members formed Unholy Ghost and recorded a demo in the winter of 2003. The next Diabolic album was to be be called Torrential Reign. The Floridans were at The Sonic Ranch in Texas with producer Neil Kernon in the summer of 2003. They later entered Morrisound Studios to begin the mastering of the newly-renamed Infinity Through Purification album. The lineup now featured Ed Webb again, as well as guitarist Hersemann and drummer Barthelemy. The band toured with Exhumed in the late summer of 2003. Word came in the summer of 2004 that the band has succumbed to all the turmoil and disbanded. Diabolic reformed in 2006 with a line-up of guitarist Kelly McLauchlin, drummer Aantar Lee Coates and Blastmasters members Jesse Jolly (vocals and bass) and R.J. (guitar). A new album, called Shellfire And Tombstones, has been recorded and is being shopped to labels. Instead, an album called Chaos In Hell/Possessed By Death was eventually released on February 29th of 2008 through Deathgasm Records. It comprised the band’s latest two EPs as well as a video for the song Engulf The Enchantress. Florida’s own death metal band Diabolic recorded a new full-length album, called Excisions Of Exorcisms, in 2009 and was searching for a record company to release it. The reconstituted Diabolic would release its next full-length album, still called Excisions Of Exorcisms, on April 20th, 2010 through Deathgasm Records. The album was recorded at D.O.W. Studio in Florida with producer Juan "Punchy" Gonzalez (Morbid Angel and Terrorizer). Joe Petagno who had worked with Motörhead in the past illustrated the artwork. Diabolic now featured Jeff Parish whose one of previous bands, Blastmasters, was on Deathgasm Records. Diabolic signed a publishing deal with Salem Rose Music next. Diabolic original member, singer and bassist Paul Ouellette, was again ousted from the band, due to his “drunken and unprofessional behaviour, and walking offstage mid-song during the band's recent performance” on Friday November 12th, 2010 at Goregrowler's Ball IV in San Antonio, Texas. The Tampa, Florida-based band was seeking a replacement and could be contacted at aantar@diabolic-deathmetal.com. Ed Webb was part of the Massacre touring line-up in 2011 and 2012. While the Conquest Music information sheet annoyingly neglects to provide the band's line-up, background or how the quartet is also soon appearing on a Dwell tribute CD, it goes on to uphold a Conquest Music tradition. It shows off how someone somewhere has looked favourably and said something positive about the band at hand. Time and time again Conquest believes a reviewer should be impressed if some glossy, good review-in-exchange-for-advertising magazine says something good about a band. This time, the reference is to Metal Maniacs which has written something nice about the pay-to-play event dubbed Milwaukee Metal Fest. Provide some real information too at least! The much-delayed - ditto for the new Monstrosity - debut from Florida's Diabolic has arrived and even though one was beginning to grow wary of the wait, Supreme Evil was well worth it. The Deicide look-alikes have mastered the art of death metal, and that is real death metal not Terrorizer magazine's idea of it. There are no concessions to girlfriends, Allah, Jesus, Buddha or the latest trend. Diabolic goes for the jugular with all the grace of a terminator. Heaping generous doses of Monstrosity and Morbid Angel, mixed with Immolation's occasionally dreamy, yet proficient, soling, Florida's latest pushers of death come up trumps on this ten-tracker. Fast blasts, giant riffs and an exploding sound come together on stand-out tracks like Dwelling Spirits, Wicked Inclination and the title track to serve a mandatory stew for every disciple of the grim reaper herself. - Ali "The Metallian"
In general, I have consistently remained against labels releasing underground demos on CD, etc as full fledged releases. Let the underground remain the underground remains a good motto. This is the case here: Fadeless Records taking Floridian natives' Diabolic's demo, adding value in the shape of two exclusive tracks, and putting it all on one MCD. This is a good opportunity for fans who liked what they heard on the band's debut (released recently on Conquest) to hear the band's demo, but more likely is the explanation that this was originally scheduled well before the band's debut, but the underground being what it is, the CD only now sees the light of the endless night. Clearly a Florida entity with their tight blasting and controlled mayhem, the evil ones maintain a fascinating heads-down-here-we-go speedy attitude, which they cleverly augment with a bestial touch (a la Incantation say) to break the over all tedious discipline of the Florida sound. With vocalist Paul Ouellette grunting much like David Vincent (hear the title track) and ex-Horror of Horrors drummer Anatar riding his skins; Diabolic, and their dreamy Immolation-inspired solos, prove to be a shining example of unadulterated death metal. This is for the purist which rejects the wimp endorsements of today's flavour-of-the-day, and as such, two devil's horns up! - Ali "The Metallian"
This is the album that Krisiun should have recorded. 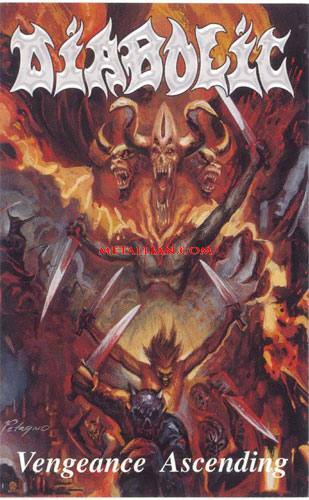 Diabolic is the personification of Florida death metal 2001. The band picks up influences from its predecessors including incredible drumming (the bass drums are a 'vengeance ascending' unto themselves!) and adept and involved lead work, raises the speed bar and applies hell! Next time skip the Morbid Angel clone track #9, make the rhythm guitars sharper and don't change a thing! As for the fans: buy this now or crawl back to your retarded mallcore albums! In fact get this album and listen to the samples on Celestial Pleasures to hear what this album does to Slipknot!! Buy this. - Ali "The Metallian"
This is death metal pure and simple. Infinity Through Purification accomplishes the mission by means of gargling death vocals, blasting drums, present and clear bass, fast and furious guitar jabs - with near-perfect rhythm and solos with the the latter in a whole class onto itself and reminiscent of the Monstrosity demo/7" - and more!. The highlight might be the fast and ripping metal solos supreme. It is hard to say enough good thing about the guitar playing here, but the whole album has come out waving the flag of death metal proudly. At times dreamy and at times racing, the axe wails like a siren foreboding of danger. Listen to the melody on Spiritual Transition or the protracted and proficient soloing at the end of Procession Of The Soul Grinders. It is not all fast material though. The band creatively alternates the speedy material with slower interludes to good effect on Descending Through Portals Of Misery. This particular song bears a strong resemblance to classic Slayer. The album ends with record-breaking rapid-fire vocals on the ironically-titled Enter The Maelstrom. The rhythm sound needs to be sharper; Diabolic still is clearly in search of that elusive optimal production. Having said that and despite a revamped lineup the new Diabolic has turned out to be no less than a killer death metal album. This Florida act has devised a way to simulate the firing of a machine gun to the head via standard home stereo speakers. Now why would anyone say "no" to that? - Ali "The Metallian"
The latest Diabolic album, Excisions Of Exorcisms, is everything a good (Florida) death metal album should be. The album is short, very unsweet and with clear Deicide and Morbid Angel influences. The title track begins the album with demons of Deicide and hell and goes at it with speed and full vigour. There is loads of speed, blasting and death gnawing at ears and souls on this disc. Mid-album it slows down a la Morbid Angel, but that is a temporary setback. It soon picks up and attacks with purpose. This is a recommended album any way one looks at it, but the production could have been better. The drums are muffled with the snare making little impact. It is a pity because Aantar Coates plays his heart out. On a positive note, the guitars are chaotic and manic. Each solo comes across as sic guitars on a rampage of pandemonium. This is rather unique with Diabolic.